Dr Sarah Northcott, a Research Fellow and Speech and Language Therapist in the School of Health Sciences, is the first ever recipient of the Stroke Association’s Jack and Averil (Mansfield) Bradley Fellowship Award. 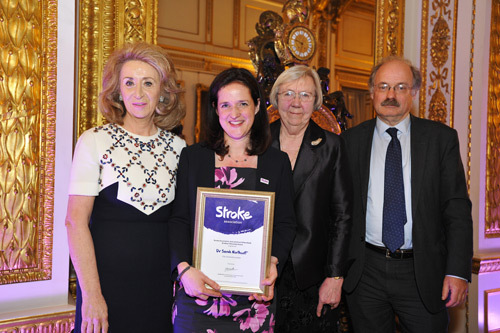 The award was presented in person by Professor Averil Mansfield CBE, the first UK female Professor of Surgery and former chair of the Stroke Association, at a ceremony at Lancaster House. Dr Sarah Northcott will use the three-year fellowship to explore whether a particular type of talking therapy can help people with aphasia, a loss of language which often results following a stroke. In particular the study will investigate participants' experiences of the intervention, and prepare the groundwork for a future larger scale trial. Around one third of people who have a stroke will develop aphasia, or language difficulties. Impaired language can profoundly affect a person’s sense of identity, social relationships as well as mood. Yet due to their language difficulties they are often excluded from stroke research. In particular, there is little research into adapting psychological ‘talking therapies’ for people with aphasia. Given the high rates of social isolation and psychological distress amongst people with aphasia, and the current poor evidence base, there is a pressing need to investigate effective psychosocial interventions. By adapting a form of therapy known as Solution Focused Brief Therapy (SFBT) for people with aphasia, Dr Northcott hopes the project may provide a valuable tool with which to address their psychosocial needs. The current proposal builds on a small-scale study where five people who had mild to moderate aphasia were offered SFBT. Participants found the therapy approach to be highly acceptable, and reported improvements in their participation, mood, social relationships and confidence, for example, they were more confident to order a coffee in a café or speak to strangers in a shop. “I am really excited and honoured to receive the Stroke Association Jack and Averil (Mansfield) Bradley Fellowship Award for Stroke Research. This will enable me to carry out a research project exploring whether we can adapt Solution Focused Brief Therapy (SFBT) for people with both mild and more severe aphasia. SFBT explores a person’s strengths and resilience in order to make small, meaningful changes in their everyday life.